I'm not super-crafty, but I enjoy some knitting and crocheting, and now and again I try my hand at other crafts as well. 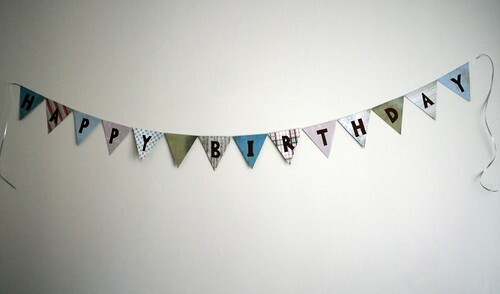 Like this birthday bunting. Oh, I love it. 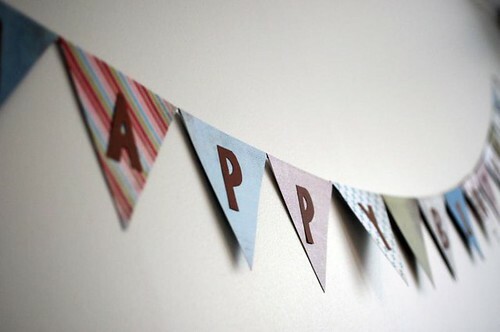 I made it for a birthday party I held over the weekend, for my darling sister, and I'll be using it for lots of more birthdays to come. I used a tutorial that I found here. Nice job! That looks great. I do cross-stitch and love Scandinavian Folk style patterns but they are hard to find. I love reading your blog, my ancestors are from Sweden and I'm always curious about life there plus your recipes are delightful. I'm grateful for your English posts because I don't know how well I'd do speaking Swedish ;) lol. Hi there- I'm Adventuroo, the one who created the tutorial. Yours looks fantastic! I'm so glad you found the tutorial useful!